A student with a learning disability recently told Kelloggsville High School art teacher Donna Casmere that she was unable to take notes. Casmere’s response: “Draw them.” There’s always a way in Casmere’s class. The Kelloggsville teacher seems to spark creativity wherever she goes, and she has made it her life’s mission to provide children experience in art during the school day and far beyond. Her artistic flair permeates the school through the murals, paintings and textile bags hanging on the walls. 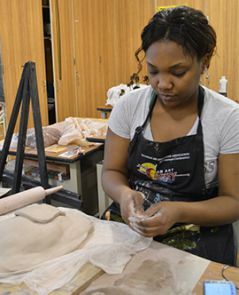 During a recent class, Casmere gave tips on the clay pinch pots students were molding and helped them learn to seal clay on the potter’s wheel. She checked out junior Gabriel Rosario’s pinch pot, complimenting his design. “I love it. It’s very different and unique. It reminds me of cogs or a machine where all the gears connect,” she said. When asked to describe Casmere, a smile involuntarily crosses each student’s face as they formulate their thoughts. They explained she evokes a feeling of confidence in them and creates a positive atmosphere that isn’t present just anywhere. “Energetic, fun” and “quirky” are words students used to describe her. Kelsea’s words about Casmere’s approach to teaching rang truer and further than she probably knew. In the many students whose lives are “messy and out of place,” Casmere, who has taught in Kelloggsville for 36 years, sees teenagers who are making the best of it, often dealing with issues much more complicated than tests and grades. “It’s amazing that they made it to the door and were able to come in to school,” Casmere said. In art class many of them can express themselves through painting, drawing or on the potter’s wheel. With a little coaxing, they learn what they can do. 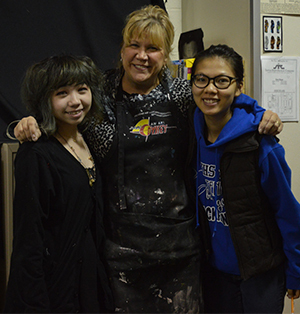 Junior Linh Le, who recently won an award from the Michigan Art Education Association, said Casmere mixes art instruction with life lessons. Casmere grew up in Detroit and fell in love with art as a child, when her mother would drop her off at the Detroit Institute of Arts and let her roam for a couple of hours. She graduated from Western Michigan University, studied master level classes at Kendall College of Art and Design, and went on to teach art to students with all levels of ability. 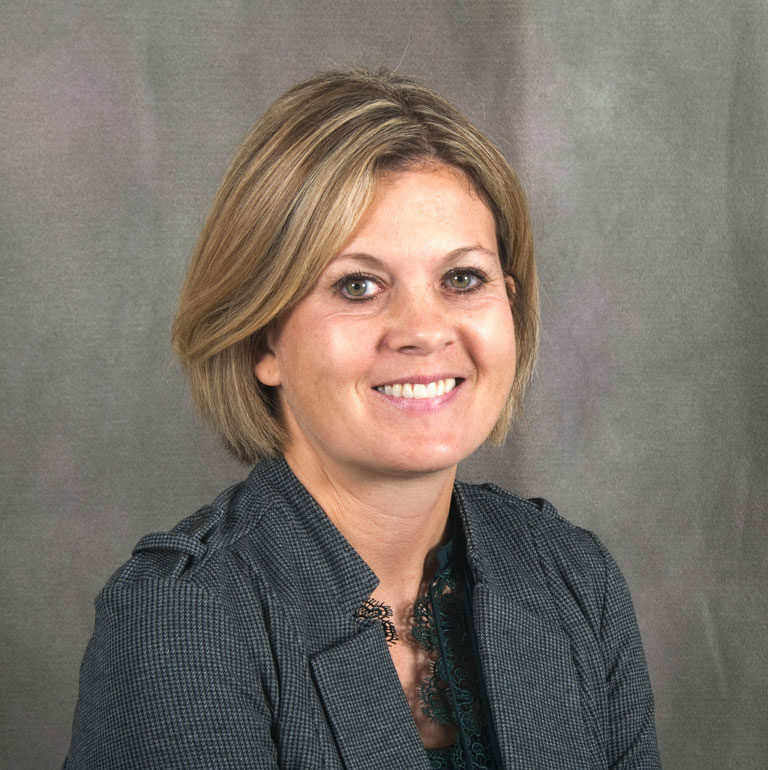 She began her teaching career in art through a shared-time partnership through Kelloggsville with St. John Vianney Catholic School and Kelloggsville Christian School.She taught at Wyoming Community Education, in foster care homes and in the criminal justice system. She said she works to show students how art fits into everyone’s life. At the high school level, sometimes that means re-opening students’ eyes to the possibilities they knew as young children. “One of the things that I find about kids is that they’re inquisitive, especially when they are younger. When they get to the high school age, they have an idea that they can’t do things.” She tells them to try, be brave, not fear drawing outside the lines. “You have to be able to take a risk and try something new,” she said. In a world of standardized testing and regimented programs for students from early childhood through graduation, Casmere believes it’s a message children don’t hear enough. “I think they need a time to exercise that other half of their brain,” she said, noting the need for students to learn to relate to people, communicate one-on-one and learn though creativity. Art, which is often pushed aside at schools to make room for increased academics, crosses many subjects, Casmere said. Not a class goes by where students aren’t applying concepts of math, history or science into their projects. She teaches art history, making students aware of the many ways society impacts art. Casmere also teaches students what they can do for their community through art. Community service projects always have been on top of her list of priorities. Funded by Kent ISD service learning grants, she has led the creation of a school mural that reflects students and their interests. Last year, her classes made cardboard houses for a House is a Home project and auctioned them off to raise money for homeless families in the district. This year, students created fabric backpacks for Kids Food Basket, and plan to make art for the Kelloggsville Community Garden, at 977 44th St. SW, in Wyoming. “When you get them fired up, students are so passionate about what they’re going to do,” Casmere said. Because of limited space for art in students’ schedules, Casmere also has offered Creative Kids Art Camp for 20 years, pairing high school and middle school students with younger children for monthly art lessons. She also heads the Art Club, bringing high school students to museums, competitions and other venues. She has an open invitation to students, parents and community members for a biannual trip overseas. For 20 years, she has organized trips to Spain, Italy, Switzerland, Norway, Japan and several other countries. The next trip is planned to England, Ireland and Wales in June, 2015. Students raise money for the trips, which are offered through EF Educational Tours. “To me, the most amazing thing is to have them look at a castle and have their jaws drop,” Casmere said. Travel can be life-changing, she added. “For many of them, they think it’s a once-in-a-lifetime opportunity, but after they go, they realize life is full of opportunities,” she said. Casmere notices when people need art, students and teachers alike. In a show of support for a science teacher colleague battling breast cancer, Casmere’s students created 1,000 origami cranes and hung them throughout the halls. They were inspired by an ancient Japanese tradition which promises that a person who folds 1,000 cranes will be granted a wish, such as long life or recovery from illness.